When Congress passed the FLSA, advocates ensured that a section allowed sheltered workshops to get permission to underpay workers. They could apply for 14(c) certificates, named for the section of the law that allowed them to do so — and by law, they could pay workers on the basis of their productivity in comparison to nondisabled workers. If it took someone twice as long to assemble a widget, for example, they could be paid half as much. Over the course of the 20th century, opposition to sheltered workshops began to grow in the disability community and among those working in solidarity with them. Disabled people argued that they should get fair pay and work in the general community, not in segregated environments. 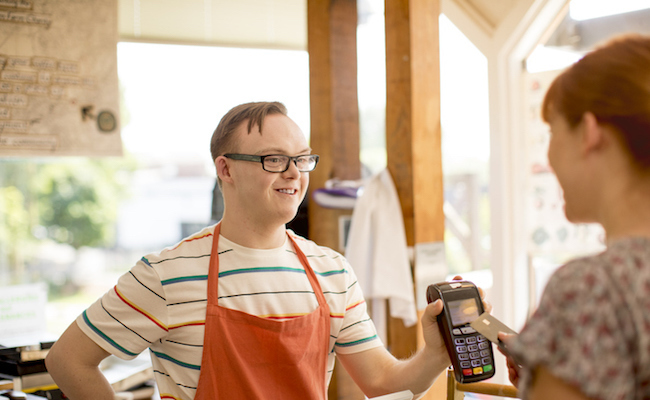 This is known as competitive integrated employment, and it acknowledges that disabled people can and should be able to work in the general community, even if some individuals need extra job training or assistance. As a result, service organizations slowly began shuttering sheltered workshops – in part due to state pressures to close them — and they often refused to fund new enrollees. Those same groups began working on placing disabled people out in the community so they could lead more fulfilling lives. There’s been some resistance to this effort, especially among older parents of adult disabled children. They fear that the change for people who’ve been in sheltered workshops their whole lives is too stressful, or that their children will be exposed to harassment or abuse. Evidence from programs making the change, however, suggests that they may not have as much to worry about as they think they do; many people are settling into new jobs very well, and they find them incredibly rewarding. Talking to people who have transitioned out of sheltered workshops is a powerful illustration of how valuable autonomy can be. Now, Congress is catching up with this bill, which would get rid of 14(c) certificates. The legislation would also provide funding supports for this transition, ensuring that disabled people have access to the services they need to thrive. In the process, it will also ensure that disabled people are protected by other provisions of the FLSA — including measures designed to protect people from abuse, harassment and unfair treatment on the job. Interested in supporting fair pay for disabled people? Call your lawmakers, and ask them to sign on to, and support, these bills. It’s the 21st century. Everyone deserves equal pay for equal work. This is good news! Many thanks for sharing. Disabled people shouldn't be paid less than the minimum wage. I am retired, but I worked for over 29 years with developmentally challenged adults, many of whom worked in sheltered workshops. "they could pay workers on the basis of their productivity in comparison to nondisabled workers. If it took someone twice as long to assemble a widget, for example, they could be paid half as much"
The so-called productivity of nondisabled workers was established by a nondisabled employee of the workshop performing the task for one hour. No one, disabled or nondisabled would or could maintain the resulting "standard" for an eight hour day and 40 hour week, so the resulting pay rate for my clients was grossly unfair. At that time in the 1980's and 1990's I protested this way of determining the wage scale and I considered, but unfortunately never wrote an expose entitled "The Use of 'Useless' Workers". Good job now maybe YOUR postings will improve and most of all make sense FINALLY ! !